To celebrate the last month of Made in the USA, we’ve asked Phillips staff to create acrostic poems for works in the exhibition. We’ll feature some of our favorite submissions over the next few weeks. Talking baseball in December. Why not? Marjorie Phillips, Giants vs. Mets, 1964, Oil on canvas 36 1/4 x 42 in. ; 92.075 x 106.68 cm.. Gift of the artist, 1984. The Phillips Collection, Washington DC. 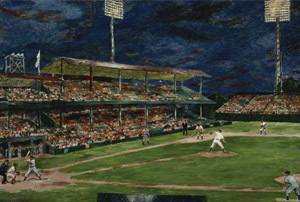 I was drawn into Marjorie Phillips’s Giants vs Mets (1964) not only for its outstanding perspective and subject matter (her baseball paintings are among my very favorites at The Phillips Collection) but also for the unique moment in the game that she chose to capture. Since there is no scoreboard featured we cannot distinctly determine the exact point in time or the score of the game, but we see runners at second and third, which presents a scoring opportunity for the team at-bat. The right-handed hitter (determined by the positioning of his follow-through) has just made contact with the ball, as we see several players looking skyward. However, the runners at second and third are not actively sprinting towards their destinations, and the player in left field is actively locating the ball in the air. Doing some further research, this particular game may have been the May 31, 1964 game between the San Francisco Giants at the New York Mets. They played a double-header, San Francisco taking the first game 5-3 and also the second, marathon-length 7 hour and 23 minute game by a score of 8-6. That second game lasted 23 innings and New York tied the game in the bottom of the seventh inning, scoring 3 runs to force the extra innings. Joe Christopher was at bat for the Mets and he hits right-handed, driving in a home run to left-field/center-field to bring home Roy McMillan from third base and Frank Thomas from second base.